Yisrael Beytenu's death penalty for terrorists law approved by coalition leaders' forum and will be voted upon by the Knesset. 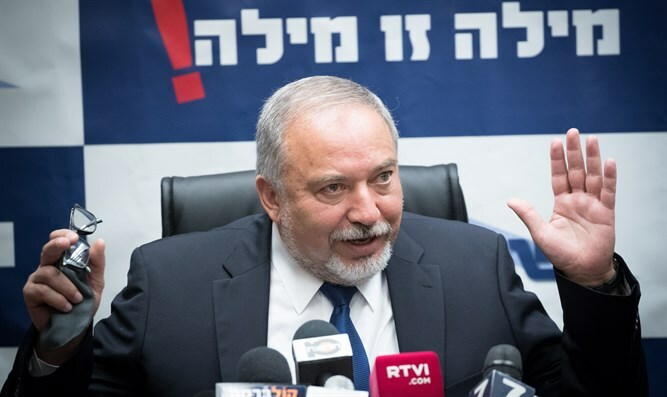 Following the demand of Defense Minister Avigdor Liberman, the leaders of the coalition parties on Sunday evening approved the Yisrael Beytenu party’s bill mandating the death penalty for terrorists. The bill will be brought to a preliminary vote in the Knesset plenum. "The legislation should be very simple and very clear - a terrorist who comes to kill innocent civilians will be sentenced to death. No more convenient prison conditions, no more pictures of cheers for freed murderers, no more academic degrees,” continued Ilatov, who noted that the bereaved families whose loved ones were murdered by terrorists face the unbearable pain and sorrow every day "while the terrorists enjoy comfortable conditions in the prisons. For the bereaved families, this fixes a historic injustice." "I welcome the approval of this important bill, and I hope that it will soon enter the law book of the State of Israel. I expect all MKs to vote for the bill, this not a matter of right or left, it's a matter of justice," he concluded. Defense Minister and Yisrael Beytenu chairman Avigdor Liberman welcomed the approval of the law, saying, “The murder of Sergeant Ron Yitzhak Kukia proves once again the need for a law enabling the death penalty for terrorists. The death penalty for terrorists will be a significant deterrent. We must not allow terrorists to know that after a murder they have committed, they will sit in prison, enjoy such and such conditions and may be released in the future. Our struggle against them must be very determined." Meanwhile, MK Nachman Shai (Zionist Union), a member of the Knesset’s Foreign Affairs and Defense Committee, said he opposes the death penalty for terrorists law. "Throughout history there have been many terrorists deserving of the death penalty, and yet the state has refrained from imposing this. The death penalty does not deter, but rather creates heroes of terror. Therefore, in the civilized world to which we belong, we impose life sentences but refrain from the death penalty," Shai said. MK Shai added that "the death penalty will bring with it international pressure that Israel will not be able to withstand at this time. All this for the survival of the coalition?" Last month, a Haaretz report claimed that Prime Minister Binyamin Netanyahu thwarted a proposal to impose a death penalty on terrorists who had committed particularly brutal acts. In late July, a poll found that almost 70% of respondents said they were in favor of the death penalty for terrorists, with 25.8% expressing "moderate support" and 44% "strong support."